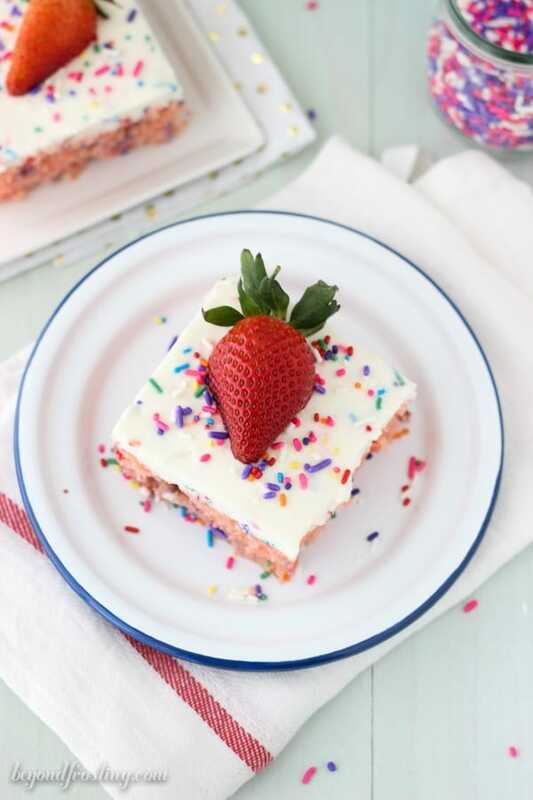 This Strawberry cake is soaked with sweetened condensed milk and topped with Funfetti whipped cream. 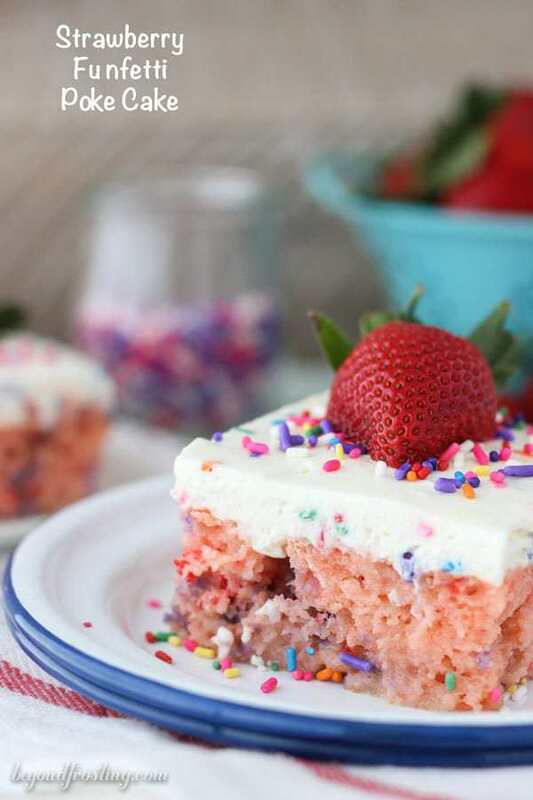 The marriage of strawberry and Funfetti has never been so mouthwatering! I must be having a serious stroke of luck lately. Some major things are happening over here, but I can quite share them with you just yet. One things I can share is that yesterday my little ol Facebook page hit 50K fans. Can you believe it?! It’s all thanks to your support, sharing, commenting and helping me grow!! Be sure to keep an eye out this week, I’ve giving away a little something to say thanks! I even made you cake to celebrate. 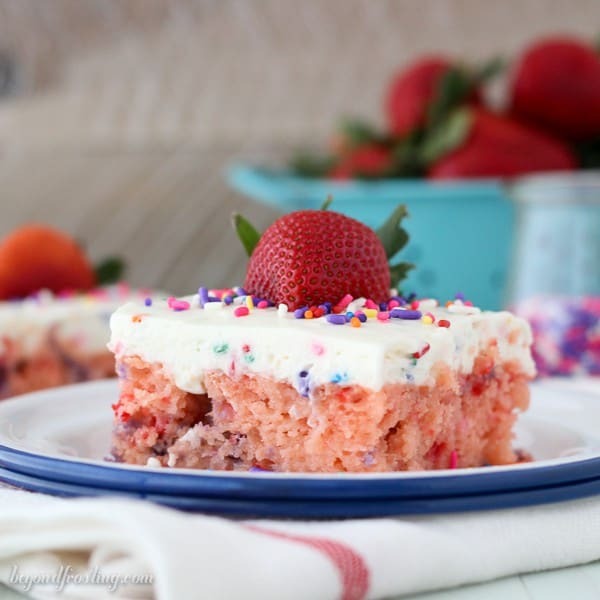 You might have noticed I shared this Strawberry Funfetti Poke Cake over at Food Fanatic. 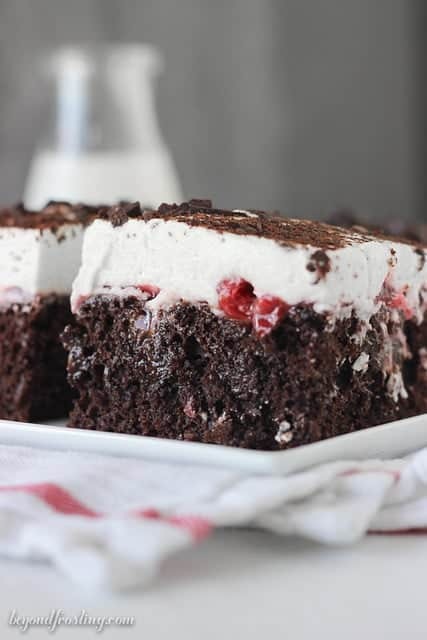 I know how much YOU love poke cake because these are some of my most popular recipes. 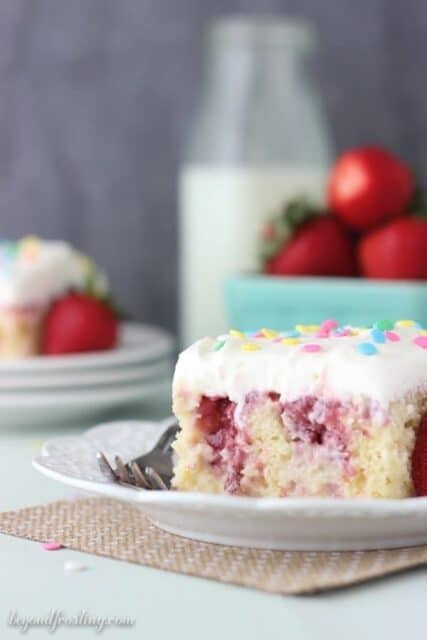 This poke strawberry poke cake is made with a strawberry cake mix, to which I added some vanilla pudding mix and sprinkles. Once baked, I soaked the cake in sweetened condensed milk. 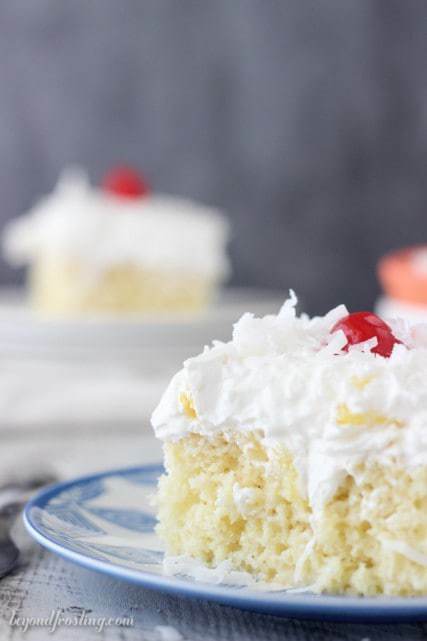 It makes this cake uber moist, almost like a tres leches cake. To finish it off, this is topped with a CAKE BATTER whipped cream. I love finding new desserts to marry together with the cake batter whipped cream. The whipped cream is thick like a mousse and tastes like vanilla cake. I don’t even need a cake to top it with, I could just eat it straight out of the mixing bowl. I don’t often use a strawberry cake mix, but when I saw it staring back at me on the shelf, I knew I had to try something. When I bought it to my usual taste testers at work, they flipped out. I don’t know if it was because this desserts was pink, or they just truly loved it. There is something about pink desserts, ya know? I chose not to add fresh strawberries to this cake, and instead added them on top when I served the cake. 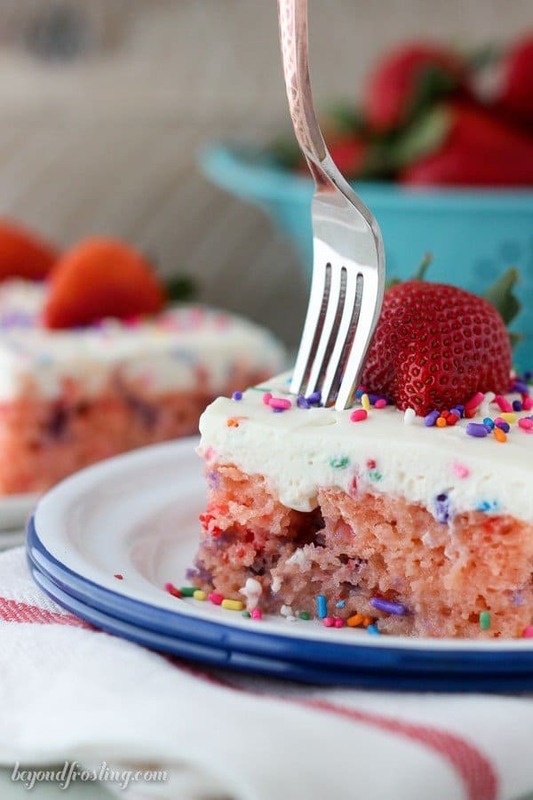 You could absolutely cut the strawberries up and add them to the cake, but I prefer the cold strawberries with the cold cake. With summer quickly approaching, I know you guys have graduation parties, pot lucks and picnics. 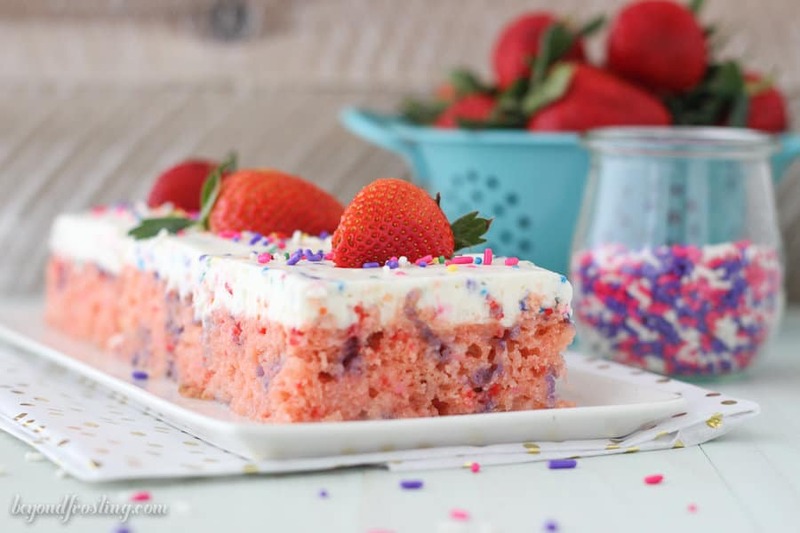 Wow your friends with this Strawberry Cake Batter Poke Cake! You can also find this recipe at Food Fanatic. What is exactly that 3.4 ounce box Instant Vanilla Pudding? I do not know what that would be here in the UK? Hi there, 3.4oz is about 1/2 cup of dry powdered pudding mix. Do you have pudding mix in the UK? 20-25 min? Why does the pillsbury box list 34-38 for same size pan and cooking temp? I have a gooey slip of batter now. I keep putting it back in. Inching closer to 34 min and still raw. I feel like the milk and yogurt/sour cream additions wrecked this. Now I need to go back to the store and just make it by what the box says. So frustrated. Hi Tess, I am sorry you had trouble with this. If you cake is still raw after 34 minutes, something definitely isn’t right. I bake a ton of cake mixes with the added sour cream and while it increase the baking time by a few minutes, it doesn’t increase it by more than 10 minutes. 35-38 minutes is quite a long time for a 9-inch-13 inch cake, but I don’t often use Pillsbury cake mixes, Using milk instead of water should not effect the baking time either. What type of pan are you using and is it possible your oven temperature is off? I love the cake batter frosting! A delicious cake to bake this Spring or Summer. Awesome Joanne! 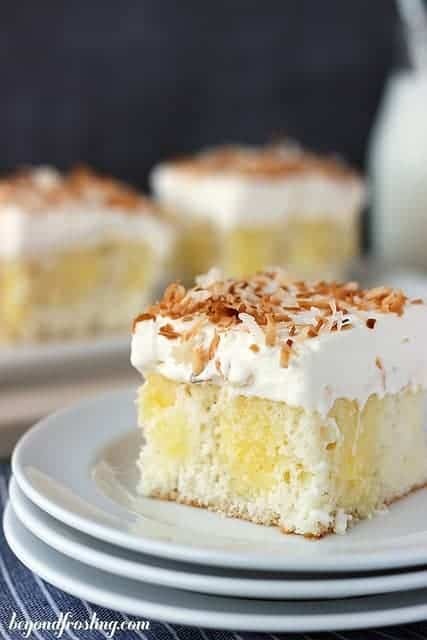 It sure is a GREAT cake for spring or summer!